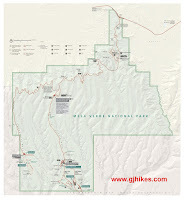 The Petroglyph Point trail is located on the Chapin Mesa within Mesa Verde National Park. The trail leads to the largest panel of petroglyphs in the park. The trail is closed during the winter months so you may want to check out the Mesa Verde National Park website before coming to help you plan your visit. 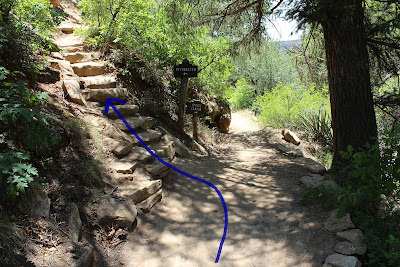 Other hikes in the museum area on Chapin Mesa include the Spruce Tree House and Spruce Canyon trails. 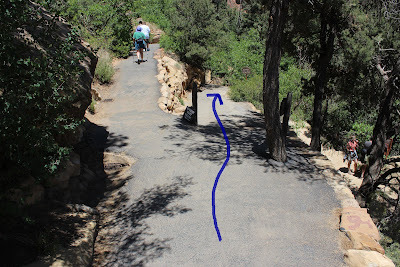 The trailhead for the Petroglyph Point trail isn't obvious at first because the trail doesn't begin until you have hiked down into the canyon almost a half mile. Follow the signs for the Spruce Tree House that begin next to the museum. Take the right fork after about a quarter mile where the trail leading to the Spruce Tree House levels off. There is a trail sign and trail register where the Spruce Canyon and Petroglyph Point trails leave the Spruce Tree House trail. The sign indicates that both trails are 2.4 miles long but that doesn't take into account the distance to and from the parking area so for this hike the distance is more like 3 miles. Hikers are asked to register before hiking the Petroglyph Point trail either here at this point or at the museum. Since you won't be coming back to this point to sign out you might want to consider registering at the museum. The Petroglyph Point trail departs with the Spruce Canyon trail about a half mile from the parking area. The trail traverses around the cliff at about the same elevation with quite a few spots of up and down climbing to get around various obstacles. Most of these spots probably don't involve more than a 50 foot difference in elevation change but they do add up over the length of the trail. There aren't any areas of dangerous exposure to falling from the cliff side so as long as you don't stub your toe and do a face plant the trail is pretty safe and easy to follow. Some sections of the trail are more primitive than others so there is a little loose ground to deal with. There are several places where you get to slip between boulders that add some nice variety to the trail and making it feel more adventuresome. None of these spots are what you would call a tight fit although you might have to turn sideways a little if you are real big. The trail builders did a great job of cutting steps and building stairs from the rocks. When you think about it you are following in much the same footsteps as the ancient inhabitants for most of the hike but with a few modifications that they didn't either deem necessary or have the tools for. There are ruins in many of the alcoves along the cliffs. A few of them aren't obvious at first but they can be found out with a little searching. This picture is of one of the more major sites along the way. The peaceful mystique of the trail draws you in as though you are in a special place where nothing else matters. It seems to be more than the usual communion with nature that accompanies you on other hikes.There seems to be an extra measure of spirit at this place much as there is at other sites in Mesa Verde. The Petroglyph Point trail is an interpretive trail, meaning that there are numbered markers or points of interest along the trail, and hikers will benefit greatly from having one of the trail guides. The marker for the petroglyph panel is number 24 and it has an interpretation of some of the symbols that was made by 4 Hopi men back in 1942. Since some of these figures are similar to drawings at other locations throughout the southwest the extra information in the pamphlet is even more useful. The pamphlets can be purchased for 50 cents at the Far View Visitor Center. The climb up to the top of the cliff begins directly after the panel of petroglyphs. Through sections of well places stones forming stairs, to steps carved into the sandstone itself, the climb is short and direct. It takes only about 500 feet of hiking to climb the 100 feet to the top of the mesa. Once the trail makes it to the top of the mesa it is about 1.3 miles back to the parking area. The hiking is much easier across the top of the mesa and takes much less time. The areas above the alcoves in the cliffs are all slick rock and it is easy to get close enough to the edge to see the trail below. The trail passes almost right over Spruce Tree House before it crosses a small dam and rejoins the original trail just below the museum. With the trail coming out near the top of the mountain just below the museum if you signed into the register at the beginning of the trail you will have to add almost a half mile to the hike if you are going to go down and sign out. You might consider signing out at the museum instead. This hike would probably rate 5 Stars with its ruins and petroglyphs if it wasn't competing with so many other top notch sites in Mesa Verde. It is probably the best actual hiking trail in the park. If you would like to see it for yourself then all you have to do is 'Take a hike'.